Neal and I (Debbie) enjoyed visiting Creede for the annual Creede Salsa Festival held on Saturday, September 3 and Sunday, September 4, 2011. I ordered tickets online for the Festival which was $8.00 per person. We attended the Sunday, September 4th day of Salsa Festival tasting. There were twelve businesses in Creede which participated in the Salsa Festival. We were given a voting card at the Creede Chamber of Commerce and from there we began a walking, tasting tour. There was the best red salsa, fruit salsa and green salsa to be voted on. 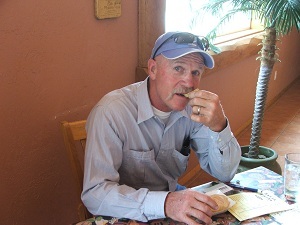 We began our Creede Salsa Festival at the Cascada Restaurant which had a very welcoming atmosphere. We were offered a glass of water and the salsa was brought out in a very eye appealing manner in small taco bowls with homemade tortilla chips to sample the salsa. The salsa was a mix of sour cream, lime juice and chipotle. It was very tasty. Next we walked to the Big 6 Bar-b-que which is owned and operated by good friends of ours, the Miles family. We were treated to corn salsa with Olathe corn. This was very good salsa and we learned that they had won the free style competition from the voting of the previous day. Our third stop was a Kips Bar and Grill where we tasted an original red salsa which was also very good. By this time, we knew our decision was going to be difficult. Jicky Jacks served red salsa. This was a very fun little coffee shop on Main Street. They also serve homemade ice cream,quiche, breakfast burritos, and a southwest burrito to mention a few of their menu items. The atmosphere at Jicky Jacks was very homey and relaxing. Next on the Creede Salsa Festival tour was Broncos Grill. This was the only fruit salsa we had. It was a very good salsa including pineapple and mango among other fruit. They also had a red salsa which we sampled. Up the street Rare Things offered a red salsa which had a very nice flavor. They also offered sangria, beer or lemonade. We always enjoy looking at the many items Rare Things has to sell. San Juan Sports made a red salsa which I decided was my favorite choice of red salsas up to that point. The woman who served the salsa is a very well-know actress in many of the Creede Repertory Theatre productions so it was also entertaining to visit with her. Tommyknockers had a red salsa which had black beans in it. It was very good and very unique with the black beans. The Creede Olive Oil offered a freestyle salsa which had feta cheese made with cucumber/melon balsamic oil. It had a very robust flavor which we enjoyed. The Ramble House had a red salsa but we didn’t feel they were too welcoming. Vicki had a freestyle red salsa which was very appetizing. Up the street from the Holy Moses we enjoyed a freestyle salsa which had peaches in it at the Off Broadway store. It had a very wonderful flavor which I didn’t really expect with having peaches in it. The Creede Hotel offered two salsas: green and red. The red had roasted tomato and the green was a green chili tomatillo. They were both very good. It took us about two hours to taste all the salsas offered by the Creede Salsa Festival. I must admit that I had enough salsa for the day. Even a small quantity at each business was a lot after sampling over twelve salsas. The highlight of my day is just spending time in Creede. I just love going to Creede. The atmosphere of the small city is just wonderful. Creede merchants are very polite and appreciative of your coming to visit. 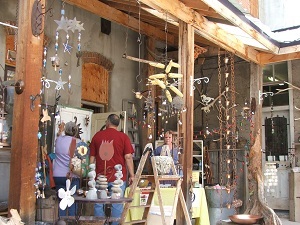 Creede offers so many activities to encourage the public to come and see their city. Take advantage of their activities whenever you get an opportunity.